Special Counsel Robert Mueller's exhaustive probe has come to an end and to the surprise of few outside the mainstream media’s sphere of influence, there was no collusion after all. Those in the media who mindlessly pushed the narrative of Russian collusion in unison will likely face no consequences for being wrong – but perhaps those who started this mess will. There are no figures in the Trump campaign who colluded with Russia – but there were at least five in the Obama administration who helped push the bogus narratives of collusion and obstruction, and they have plenty of questions to answer. In July 2016, the FBI opened a secretive counterintelligence investigation into Russian interference in the U.S. election. In violation of protocol, the FBI did not inform Congress until March 2017. Inexplicably, FBI Director James Comey said it was because the investigation was “too sensitive,” but this is precisely why law enforcement informs Congress of new investigations. The investigation was a sham from the beginning, as evidenced by many of those charged in connection to it, primarily Michael Flynn. While Flynn was charged with lying to the FBI, Comey would later tell Congress that the FBI agents who interviewed Flynn didn’t think he was lying. 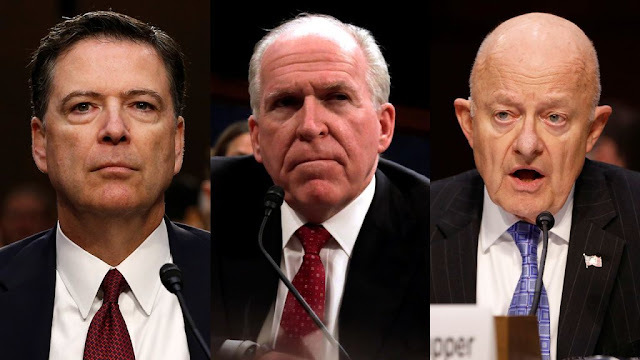 As I wrote in my book "Spygate," Brennan himself acknowledged that it was he who sparked the FBI’s counterintelligence investigation by passing on British intelligence on Trump associates to American intelligence agencies. According to one account, GCHQ’s then head, Robert Hannigan, passed material in summer 2016 to the CIA chief, John Brennan. The matter was deemed so sensitive it was handled at “director level.” After an initially slow start, Brennan used GCHQ information and intelligence from other partners to launch a major inter-agency investigation. Assisting Brennan was then Director of National Intelligence James Clapper. Clapper said he had the same “information” as Brennan, and his “dashboard warning lights were on because of that.” With limited information, the FBI pushed the investigation into a full-blown inquiry instead of alerting the Trump campaign of possible danger and stopping any further damage to the electoral process. Assessing any possible threat is one thing, but pressing into a full investigation without facts of a crime or national security threat violates standard procedure. According to Clapper, the preliminary investigation revealed no probable cause of any collusion, yet the investigation kept following this dead-end trail. Adam Schiff told CNN in December of 2017 that the evidence for collusion between the Trump campaign and Russia was “damning.” Always consistent in wrongness, earlier this month he said there is “direct evidence” of collusion. He’s now doubling down, telling ABC News' George Stephanopoulos on Sunday that Mueller not planning to issue future indictments doesn’t mean his report doesn’t include evidence of crimes (which seems odd, considering that every single person Mueller charged was outside the scope of the special counsel. Why would he stop prosecuting offenses now?). Maybe Schiff would care to share some of that damning information he’s withheld for the past two years? Rosenstein played a role in renewing the FISA warrant used to spy on Carter Page during the 2016 election by approving an application to expand surveillance, in-part enabled by British spy Christopher Steele’s bogus dossier. He signed the final FISA renewal in late June 2017, not long after he appointed Robert Mueller to head the special counsel in May. This document was used to justify Comey’s firing, which Rosenstein then used as an excuse to start the special counsel, reporting to the New York Times that he’d felt “shaken” and “overwhelmed” after Comey’s firing. That’s doubtful, as Rosenstein must have known how his memo would’ve been utilized. Never before in American history has there been such a concerted effort to take down a sitting president – and never has the house of cards collapsed so spectacularly.